A new, impressive lineup of successful artists and designers will share their inspiration and expertise with students and members of the public this spring as part of the Artists and Designers in Real Time (ADRT) lecture series. 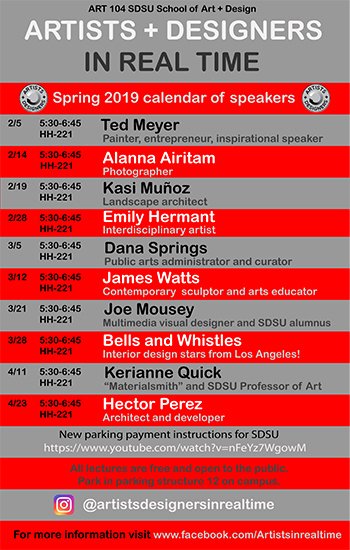 ADRT, also known as ART 104, is a class offered each semester at the SDSU School of Art + Design. Taught by lecturer, David Fobes, this spring’s lineup will showcase nearly a dozen locally, regionally, nationally, and internationally-known working artists and designers. Presenters provide direct and frank information, and advice about being an arts professional. According to Fobes, students tend to have a very vague idea of what it takes to be an arts professional. Speakers are encouraged to tell personal stories about their struggles and achievements. Fobes strives to bring a very diverse group of speakers to Art 104, ranging in experience from emerging and mid-career, to those well established in their field, as well as a broad mix of artists who are ethnically and culturally diverse. Architects, photographers, painters, new media, critics, sculptors, public artists , and curators are all represented. “I am committed to bringing in speakers who reflect the diversity of the student body at SDSU,” said Fobes. has become a leader in their field and working in their industry. “When students listen to someone very close to their own age talk about their success, it is very empowering” said Fobes. This semester’s lineup includes: Ted Meyer, Alanna Airitam, Kasi Munoz, Emily Hermant, Dana Springs, James, Watts, Joe Mousey, Bells and Whistles, Kerianne Quick, and Hector Perez.